Nikon's new Coolpix digital cameras announced a uniquely named S1200pj with built-in projector, which continued its predecessor, S1100pj. As a third projector Nikon cameras, Nikon S1200pj offers a 40% increase in brightness of the projection and the projection of a three times greater contrast, allows the projection of live images on a projection size of up to 60-inch screen. This camera can even be connected to the iPhone, iPad or iPod via a special cable to display images and movies stored on these devices as well as online content from sites like YouTube. Nikon S1200pj equipped with 14.1 megapixel sensor and 5x optical zoom NIKKOR lens with 28mm wide angle and 3-inch LCD screen. Built-in pico projector system uses three lights (red, green and blue LED) projection with a contrast ratio of 200:1 and offers 20 lumens brightness. The camera is equipped with EXPEED image processing engine provides four functions of C2 and image stabilization - Combined lens-shift and electronic vibration reduction (VR), support for high sensitivity up to ISO 6400 with small noise, motion detection, Best Shot Selector (BSS). 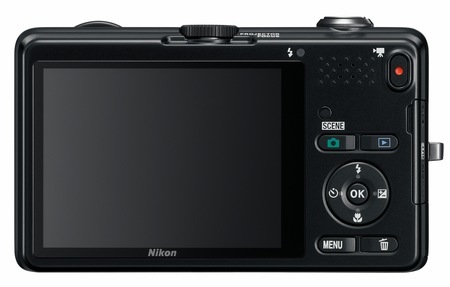 Nikon S1200pj also has 18 scene modes and a built-in automatic mode are easy to identify the type of subjects and automatically apply the image mode / scene optimally. 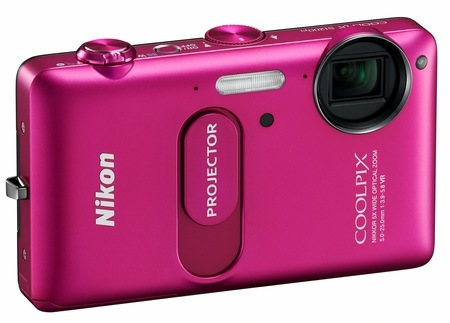 Nikon Coolpix S1200pj will be released in September at a price of $ 429.95 in black and pink (you can pre-order on Amazon now).